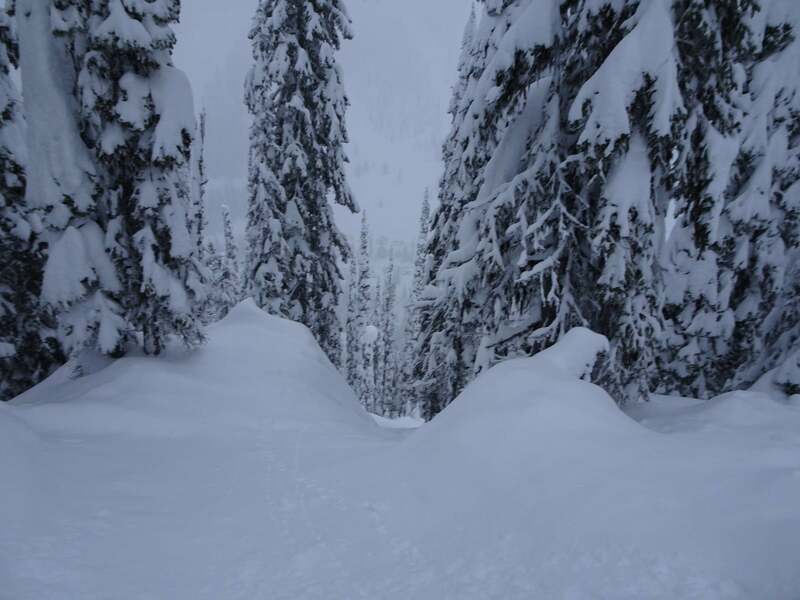 As March draws near with Spring Break dates looming and a deep desire building to find fresh snow before the season ends, many of us are turning our gaze further west. If you squint you can almost see those big mountains capped with more than a dozen feet of snow; destinations just waiting for us and a few hundred thousand other vacationers to arrive. So now is the time to ask: where are you going to go, to whom will you give your cash, and what is the experience that you seek? My bias will become apparent but let me state up front that I like big mountains with small attitudes; and I value elbow room in untracked trees much above rubbing elbows in a liftline with a well-clad crowd. I love skiing mountains that still have soul without having to trademark the word for their marketing campaign; whose roots are so real you might trip over them; and I really love sharing these “discoveries,” just call me McChristopher Columbus McCue. I will go very small to escape the oversized collectives that are now dictating their terms to more mountains every year; but this year I found three places that were as big as their corporate counterparts, as real as the bark on an Engelmann Spruce and as authentic as the laughter of children unloading from school buses pulled nearly up to the lifts. And I want to share. Southeastern skiers and snowboarders travel, a lot. We chalk up more miles than the denizens of any other region and at this time of year we will start flooding into western resorts like SEC football fans did to their bowl games. Similarly we expect our destinations to be big and flashy with a name everyone will recognize for bragging rights. And that’s all well and good for viewing a spectacle but when it comes to skiing I’m not interested in being a spectator or being at a big name venue; I am the player here (even if I am third string), and it’s all about the experience and not the cache of the destination. I have not attended a Rose Bowl, nor sadly a UNC championship game; but I have skied at Vail, Steamboat, Snowmass and a lot of great destinations; and of course I had fun but I was never as moved as I was on an empty day with deep snow at Monarch, or certainly as I have been in the backcountry off of Berthoud pass. I am rarely as satisfied by the experience of parking myself at some supposed world class destination resort as I have been finding a few great places and traveling between them. I confess that everything I am advocating is influenced by how much I love a road trip, especially through spectacular mountain terrain, and for whatever reason I plan my outings around sets of three. Here in the Southeast, I love the proximity of Beech, Sugar and App; and especially of Canaan, Timberline and Whitegrass. I also have written about similar if a little more scattered trios out west. Alta, Brighton, and Solitude, that’s a pretty solid group; in keeping with my love of the underdogs, skiing at Cooper, Monarch and Wolf Creek made for one of my best weeks ever; and White Pass, Stevens, and Crystal was certainly something to remember. You will note that most of these are not high profile destinations although all are fiercely loved by their regulars and share the virtues of being cheap, friendly, and approachable. Get there before nine and you will find convenient free parking, get there after ten-thirty and live with the consequence of your decisions last night. Now all that being said, I have my new power of three. I was in Colorado at the end of January attending the SIA/OR Show, and a great part of that is the opportunity to demo next years products at Copper Mountain. I will write another post about the products I tried but briefly: my best in show was a strong very lightweight new boot from K2 that will sell for just $499, and the remarkable consistency and do anything nature of the skis from DPS. The show was a great experience, but snow quality in Colorado at that time was very poor at best, so I planned a trip within a trip. But where to go? Well as is often the case when Colorado and Utah are becalmed under an ugly, persistent, high pressure powder blocking event –there is a lot more snow up North. 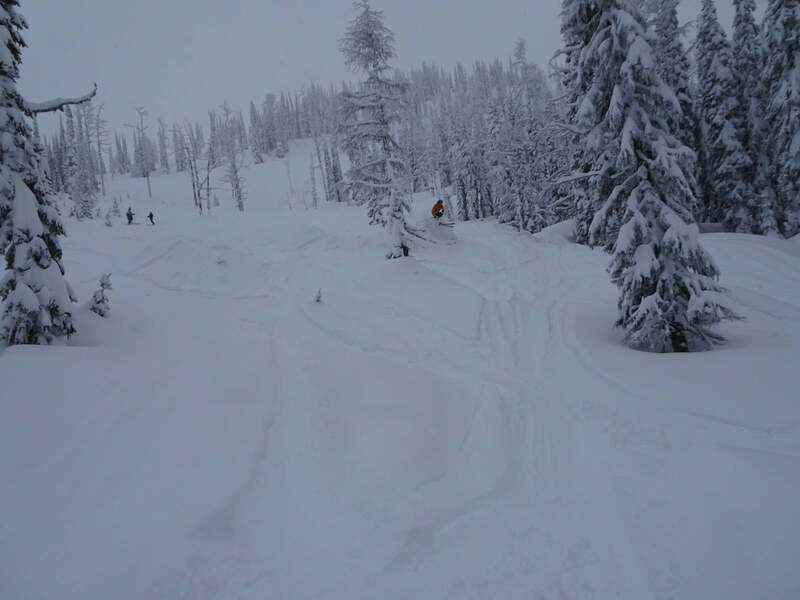 Schweitzer in northern Idaho has long been a place on my bucket list, and the famous Powder highway starts just a little farther north before heading deep into central British Columbia; thus, Red Mountain and Whitewater were in easy striking distance. So good enough, road trip on. Flying into Spokane and the joys of smaller airports. How much interaction have you had with the Denver airport, aka DIA? I am not certain if the airport is actually located in Colorado, it feels more like Western Kansas; and when it’s your point of departure, you will probably be running the gauntlet of I-70 to add a little suspense to the delays awaiting in the security maze; so flying in and out of smaller airports is always a relief. Spokane for example, has about a dozen gates with rental cars right outside the doors and disarmingly friendly people there to help. I’m not accustomed to relaxed flying experiences but I could certainly get used to it. So this was my itinerary; the Spokane airport is within three hours of Rossland B.C. and Red Mountain; the town of Nelson, gateway to Whitewater is an hour away. From Nelson to Sandpoint, ID at the base of Schweitzer is less than three hours and finally an hour and a half back to Spokane to catch my departing flight. I spread that over six days and I’ll happily clock over ten hours for two good days in West Virginia, so that puts it in perspective. All wheel drive is a must up there but much of the route follows large river valleys like the Columbia, Kootenay and Pend Oreille, so the roads are often wet but clear until you branch off onto access roads and up to the resorts. It looked like easy traveling when I mapped it and that was indeed the case, despite the canyons of snow that the roads cut through when they climb above 4000 feet. The folks up there seem fairly adept at moving snow aside, practice I suppose. Big Mountains, Small Crowds, Cheap tickets. By the standards of major western resorts these are all small in terms of crowds and development, though not by any measure of terrain. 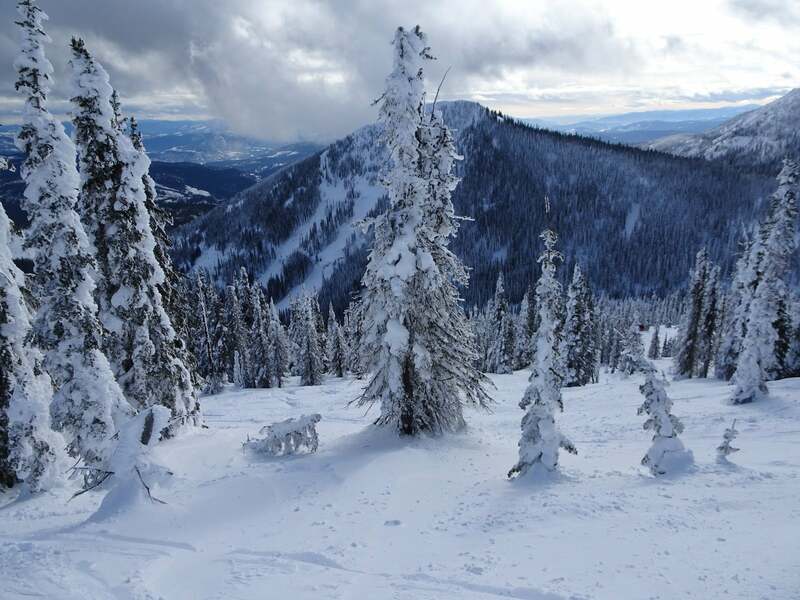 Of the three,Schweitzer sees more skier visits and has more traditional resort based infrastructure like shops, restaurants and mountain top or slopeside lodging, so in that regard it might be the most developed of the three but they all escaped the monstrous cookie cutters that have chopped up so much of the west. Whitewater and Red Mountain have weekend crowds similar to Southeastern resorts, but spread over thousands of acres. Not to pile on but just to make my point (hey we ski what we can in the southeast and we are a captive audience) but at 67 dollars USD (at current exchange rates), Whitewater’s daily ticket rate is less than an average Saturday at most mid-atlantic resorts. Looking nationally, here is an apple to apple comparison with some usual suspects out west; Snowmass has 3132 acres, Winter Park 3081, and Steamboat 2965; they all want $165 for a single day ticket; Vail is bigger and asks $199, while Breckenridge and Keystone, both about 3000 acres, want $189. 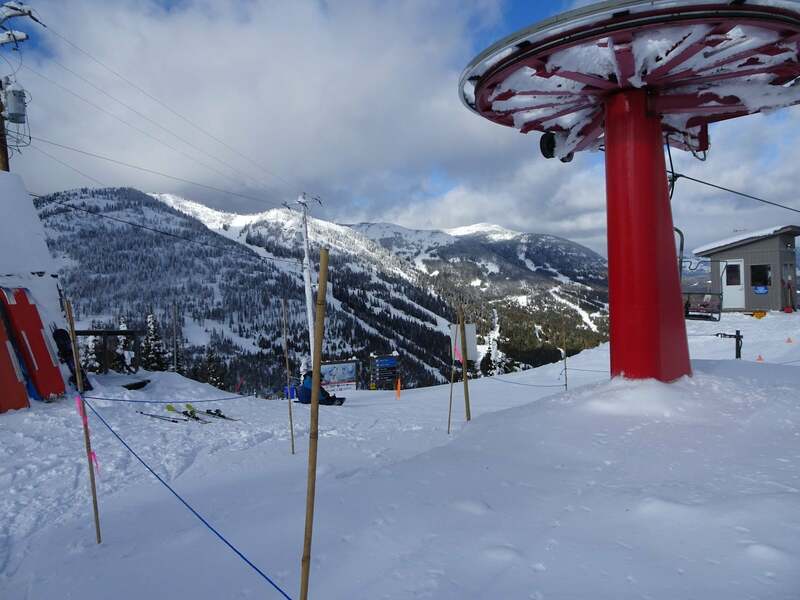 Red resort has 4200 acres (2877 lift served) on 2,919 vertical feet and a daily rate of $73 USD. 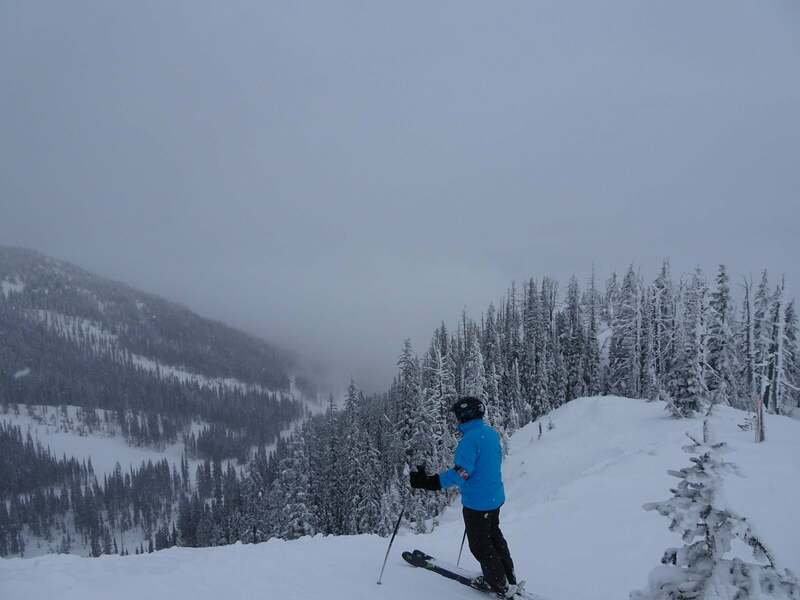 Whitewater has 2367 acres (1184 lift served) on 2,044 vertical feet, daily rate of $67 USD. 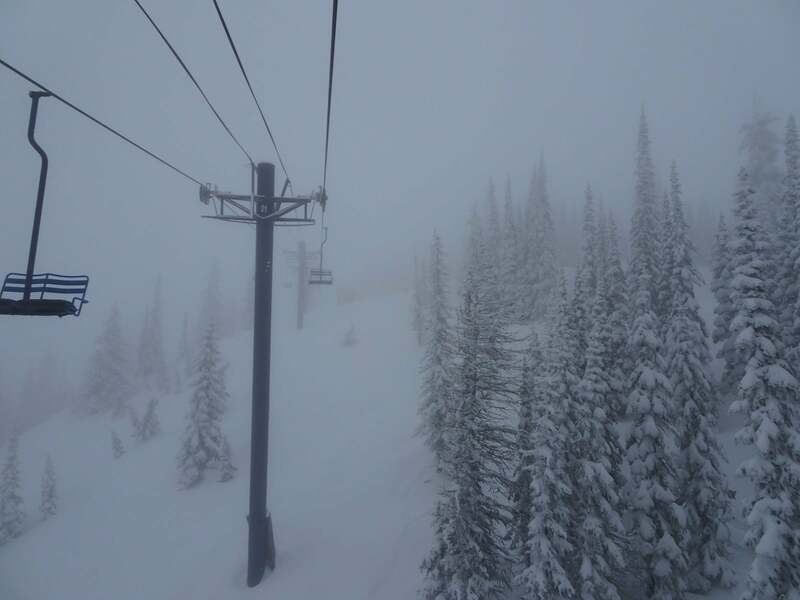 Schweitzer has 2900 lift served acres on 2,400 vertical feet and a daily rate of $79. 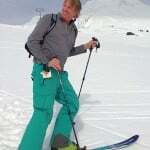 I have not forgotten products like the Epic Pass which cuts some of the sting out of Vail scale pricing but again let me suggest an alternative. 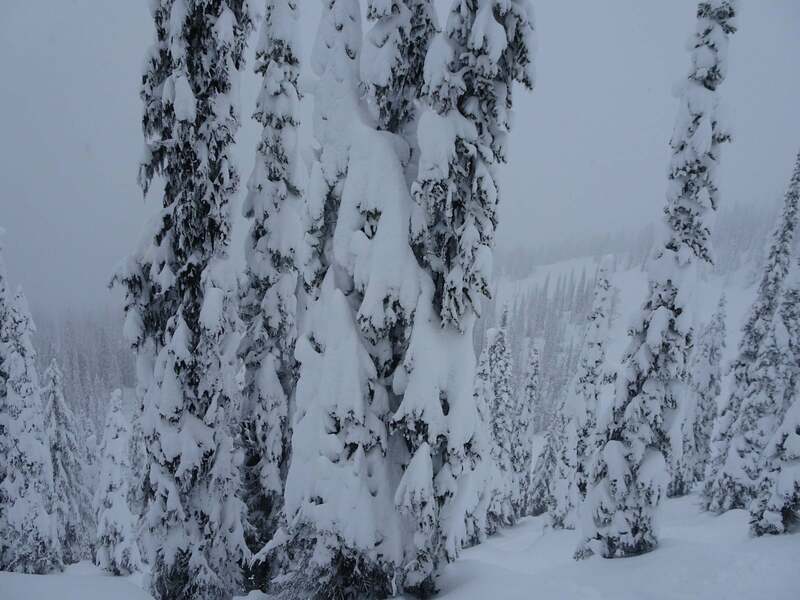 The Powder Alliance offers three free days at all its partners with a season pass from any one. So you can buy a pass to Schweitzer for example and throw in the likes of Bridger, Crested Butte, Timberline or a dozen others for three days each on a subsequent trip. Or the same trip for that matter, there’s still time. That my friends was a LOT of preamble so now let me cut to the chase and a beautiful powder chase it was. Red Mountain has always received a lot more attention than visits, but that’s changing. It is regularly featured in major ski publications with deserved hyperbole about its immense and varied terrain, for being “real ” and “core” and generally exuding an altogether excellent “vibe”. Recently it has become even more talked about due to a campaign to get needed development capital by appealing directly to the people rather than waiting for corporate largesse and all the loss of control that would follow. Their Own the Mountain campaign drew a huge amount of early interest which has now resulted in over 1.5 million in committed subscriptions. This was all done through crowdfunding on StartEngine and FrontFundr and their groundbreaking effort provides a useful model for other independently owned mountains who want to keep hold of the reins and drive their own vision forward. Support Red, they are the good guys. Red Mountain Resort is really four mountains, steadily improved for over a century with new lifts and ever expanding terrain. 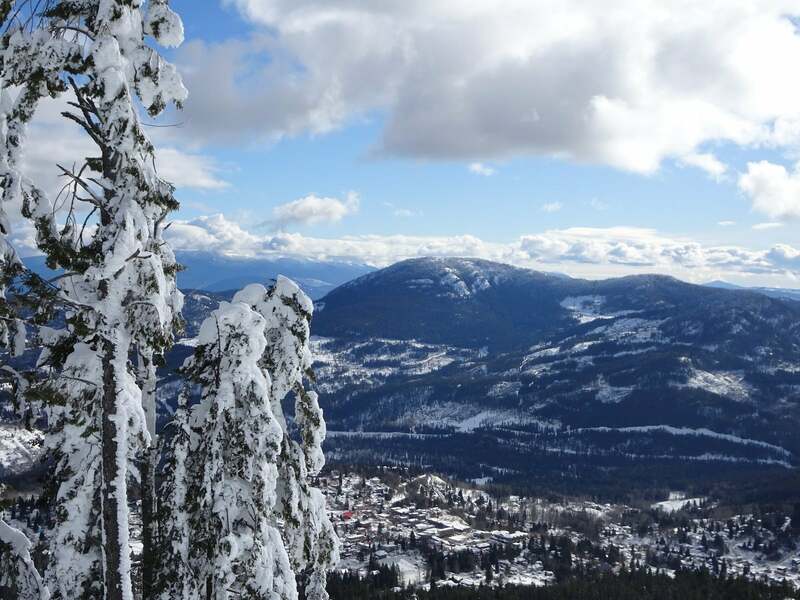 Red mountain was originally part of a gold rush and mining boom in the 1890s when the town of Rossland sprang up at its base. Skiing commenced shortly after and stewardship continued mostly under the auspices of local ski clubs including installation of the first chair lift in 1947. 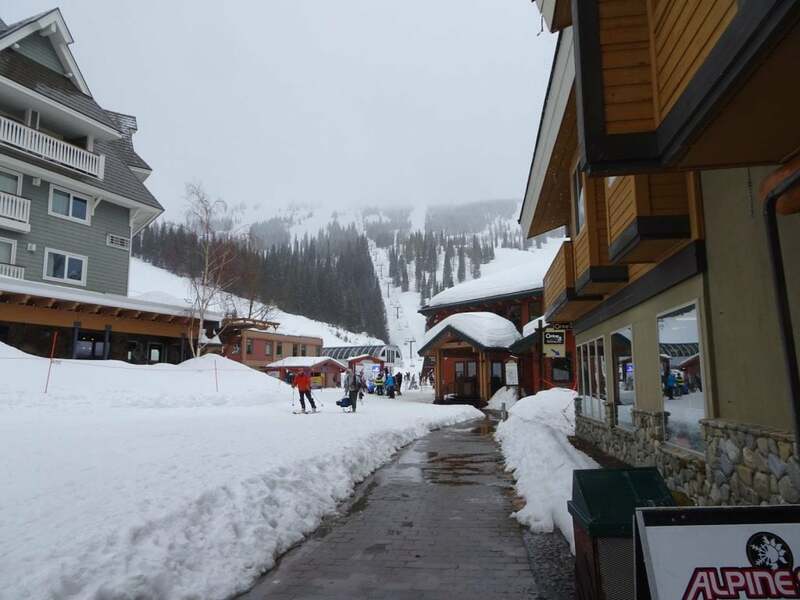 Red retains close ties to an authentic community and while there are mountainside condos and there will soon be a welcome 106-room slopeside hotel, I loved the experience of staying in Rossland, just seven short minutes from the lifts. The old red lift and three more mountains beyond. My first day at Red I got a lesson in elevation and about following local advice. I arrived a little late that morning and began exploring on my own. 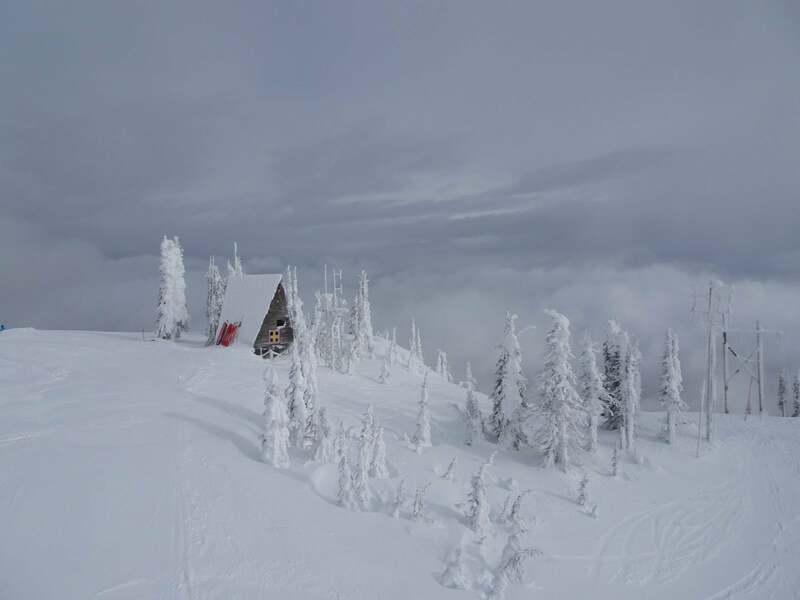 It was a few days after a big storm and the lower mountain had gone through a slight thaw and refreeze just before I arrived,with drizzle in Rossland as I headed out. 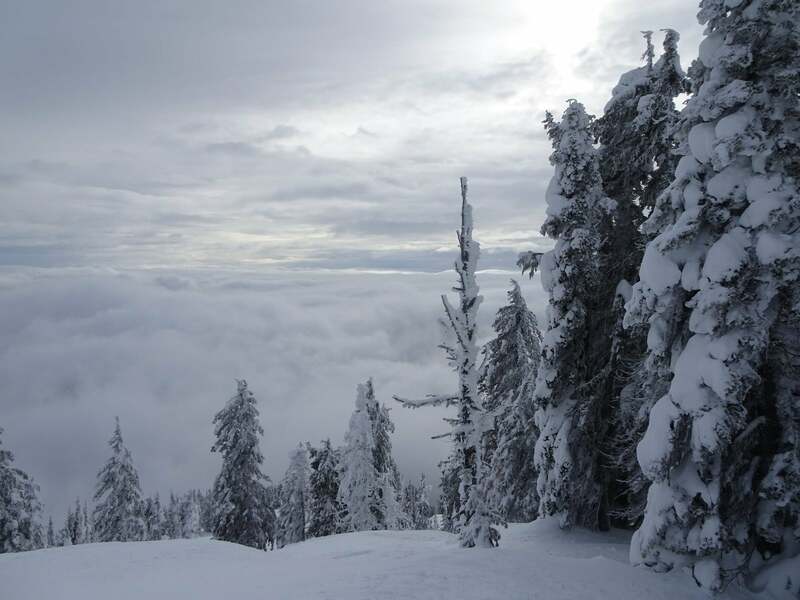 When I got my ticket I was told I should ride the Red lift for the view of Rossland but then definitely head higher to Granite Mountain and enjoy the Paradise lift where conditions consistently remain powdery and light. Instead, being stubborn and doubting that what looked like several hundred feet could matter much, I went straight into the trees under the old Red lift and after two frustrating runs had my first of many lessons. Annoyed, perhaps even petulant, I took the Motherlode lift toward Granite and when asked about my day by a well meaning local started grousing about conditions. Andrew, the local, sharing the lift chair with me grew quiet for a spell, but finally said “You know, the trees above Paradise Lodge are always very good,” and indeed they were with 1600 feet more elevation and a changed aspect.. Later over excellent six dollar chili and a three dollar Kootenay Ale, he told me that he was at first inclined to let me wallow but decided it was just too perfect a day not to share. Thanks Andrew for setting a tone that lasted through the rest of my trip. But Red is huge and I only peeled back a thin sliver that first day. The next day I kept my appointment and was guided by Mike, one of Red’s very best. We made runs all day around three mountains; my mind was blown and my legs worn out. After skiing all over the world, Mike settled on Red as the mountain he would call his own; some runs bear names he has given them and after decades he can still find something new. Red by the way is the least “labeled “ mountain I have ever skied; so let me stress now that there are free snow guide tours that meet up at the base and you should take advantage of them if you go, because your mind can’t possibly grasp it all. Granite Mountain for example is served by lifts on two sides but can be skied anywhere around it’s 360 degrees. For orientation you can break Granite into quadrants of a clock face. There are thousands of paths through the Powder Fields and Paradise, or threading through and over cliffs where freeride championships are held; fortunately, they all lead back via a continuous beltway to the base, so you can get lost but still find your way back home and there is a lot of intermediate terrain and with fun groomers on the lower mountain served by the Silverlode chair. That is just Granite Mountain; when a lift to the top of Grey Mountain was added in 2014 another thousand acres came into play. And now there is another mountain with 10 dollar cat rides to the top of Mt. Kirkup, very nice options. Days after a storm there was spectacular snow to be found and thanks to Mike’s lead I got into terrain that I had only shook my head about before; the mountain made me a better skier. That was a good two days of exploration, I intend to spend many more. Whitewater is first and foremost the home mountain for Nelson, British Columbia, and what a connection for both to share. Like myself, people arrive from all over North America, and the world, to ski at Whitewater but it still maintains that intimate local attachment. Nelson has a long history rooted in frontier, artistic and counter culture ideals and it welcomes new visitors. It’s an easy place to feel at home even when you are not a local and the skiing at Whitewater personifies that ideal. The terrain is too good, the trees and powder too endless, and the crowds too low for any one to stress too much about claiming all the snow they can lay first tracks on. No worries, as the Aussies say (and you can’t swing a wombat without hitting an Aussie anywhere in B.C. ), you really can’t run out of snow, especially in the trees at Whitewater; there’s always more to be found. Whitewater is a Valhalla of trees. 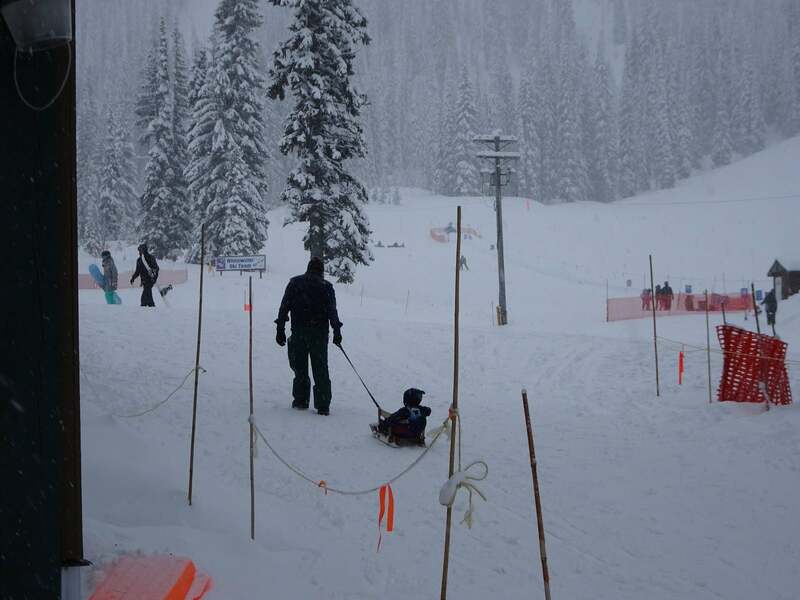 Whitewater is also a mountain for families to grow up skiing. Children are everywhere, in the lodge, around the base and on all levels of terrain on the slopes. Forty degrees is apparently not steep when you are three feet tall and have been skiing it for half your life. What a great place to grow up, I know where I want to be reincarnated. A future olympian? And notice the Saturday lift line. Getting some orientation at Whitewater is important; so take advantage of their free mountain tours; 9:00 and 12:00 usually, but ask. 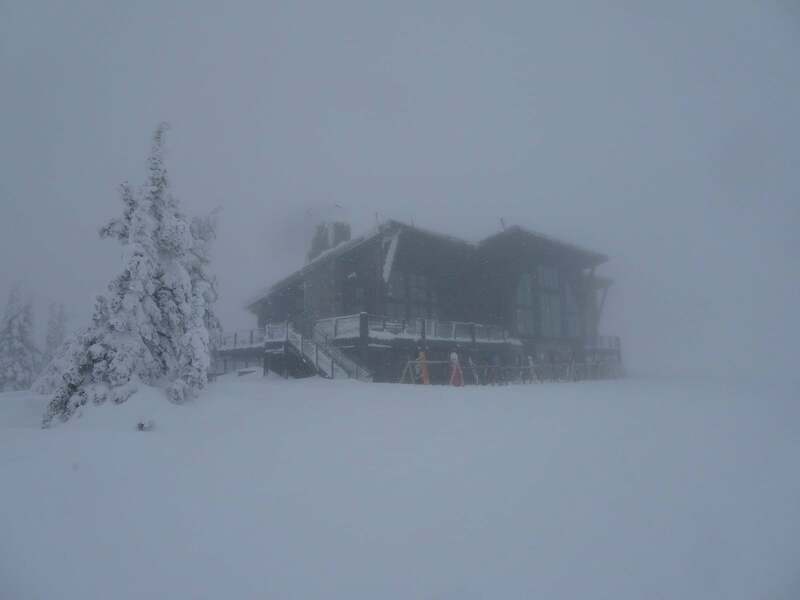 Whitewater’s complex terrain already spread over three mountain faces before 2010 when the Glory Ridge Lift was installed opening more than two thousand vertical feet of access into previously backcountry terrain. There is lot to see now at Whitewater. I loved the morning tour with Ed and John, our group picked our way through blue runs that connected the mountain with jaw dropping views into steep possibilities that I made my way into the next day. Capability and culpability are our own to determine I think; so I loved their nonchalance, “Sleeper is over there, a lot of cliffs, a pretty fun place if you like jumping off of things.” Perhaps next trip I will try jumping off of things, but this time it was all about the trees. Venturing into the exceptional surrounding backcountry is not just allowed but encouraged; Whitewater sells one way lift rides to access the exceptional backcountry skiing just beyond their boundaries ( as does Canaan Valley around here y’all, just saying). Oh and a word about the usage of Y’all; it is amusing how amusing Canadians find it to be. It is the most logical of contractions but to them it is still wildly quaint, which I find really cute. Folks I talked to on lifts and in the lodge at Whitewater, whether they were middle aged moms or twenty year old students, almost all skied backcountry sometimes. But none of them could fathom skiing out of bounds without training or certainly without rescue and avalanche gear. I did not discuss my shoddy practices with them but I am resolved I will go back and take some courses at Whitewater next year because they make it easy. 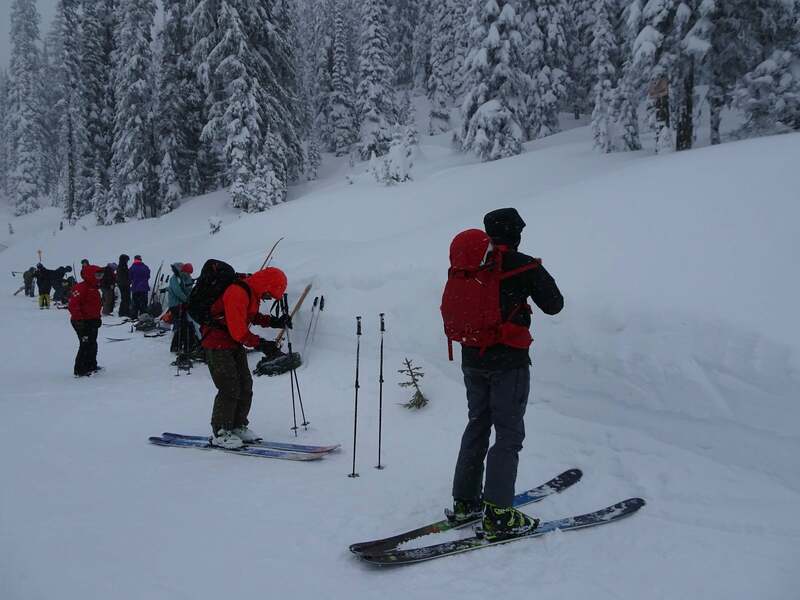 There are Backcountry primers offered every weekend and Avalanche Skills and training programs offered on many weekends each year. Check it out, lots of education. Anyway what an experience at Red Mountain and Whitewater and how welcome the people in British Columbia made me feel. I really, really appreciated it, and I’ll see y’all again real soon. 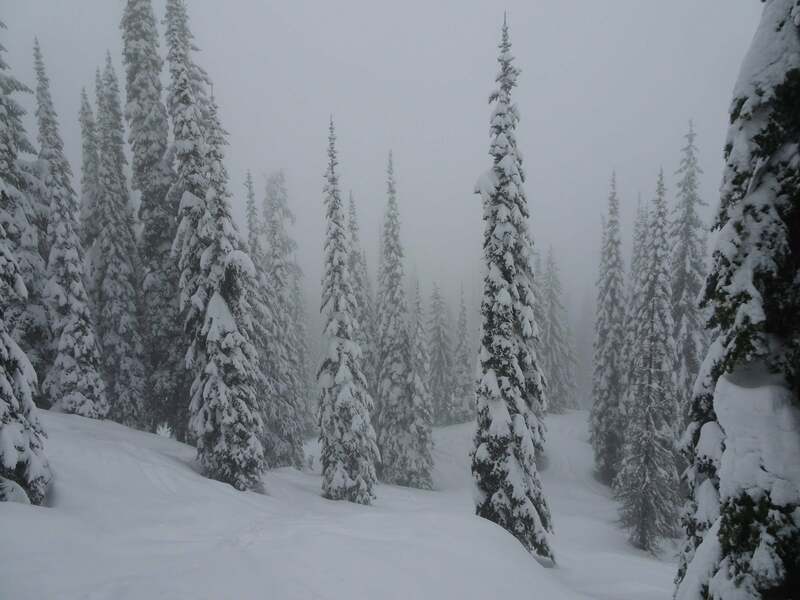 A couple of skiers who used to contribute frequently to the Skisoutheast messageboard started sending reports from Schweitzer several years ago; at the time I had never skied anywhere beyond Colorado and the pictures showing deep powder runs through massive old Cedars caught my attention and have held it ever since. However, Northern Idaho seemed impossibly far away, almost an exotic place, but I’ve kept my eye on it over the years and now my time had come. Thanks to my new gateway airport in Spokane it wasn’t so far away afterall, but it was amazing and indeed a little exotic; not just for me coming from the Southeast, the Selkirk mountains are very different from the much higher elevations of the rockies and the wind blasted continental divide. This seems a perfect place for an old Swiss hermit, Schweitzer’s namesake, to hide like a wood gnome in the glades. Schweitzer is a big mountain and its beautifully varied terrain steps through distinct trail types as you descend; with wide, open or sparsely wooded bowls feeding into tight, steep spruce forests and then large interconnected trails through tamaracks glades dotted with massive cedars that show you the scale of the place. The lift system evolved to its current configuration in 2007 and includes three high-speed lifts that access the major portions of the resort and a network of six other fixed grip and surface lifts including a new favorite of mine, a 1900 foot riblet aptly called the Snow Ghost that leads to runs like Kohli’s Big Timber and Siberia. I spent a lot of time in there because visibility at the top of the mountain was impenetrable that day and the trees were often my lifeline down, skiing double black trees by yourself is a dubious lifeline I admit and I ultimately tried to keep some lift within sight, for most of the day though I was thrillingly alone. It was not a day I would have chosen to fully appreciate the place with steady rain at the base and thick cloud ringing the top, but I got a taste and was definitely hooked. Next year I intend to fly there again and before going remote start by giving Schweitzer the time and exploration it deserves. 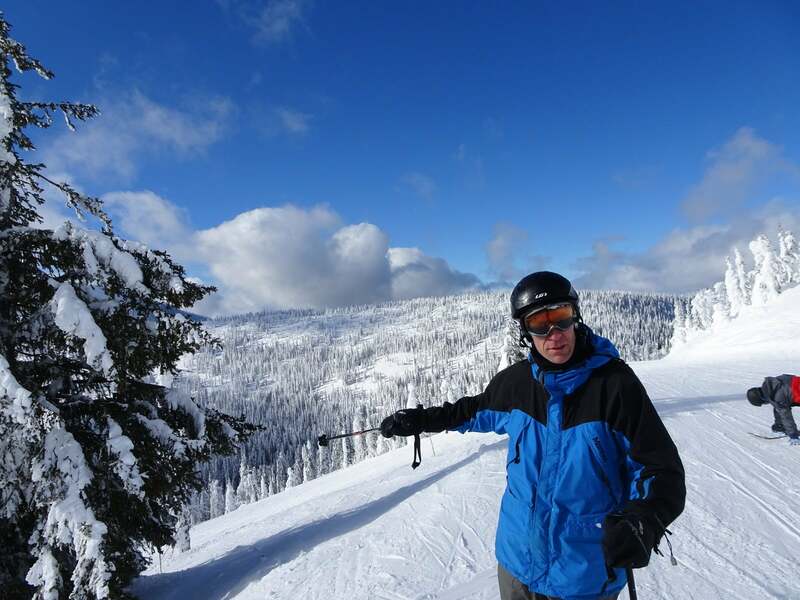 I would characterize Schweitzer as the most traditional of the three in regard to a resort experience with an array of lodging options and base amenities, and a lot of visitors taking advantage of week long vacation packages. It would be a great place to stay and learn, improve or excell. If it’s just yourself or a couple of friends there are also some specials worth noting. There is the $99 Spring Fling pass which allows unlimited skiing from March 12 until closing day, and that payment can also go toward next years season pass which will make you a member of the Powder Alliance, with three free days at all the member mountains. They also sell transferable three pack which provides a lot of flexibility for $199. If you are making a trip on short notice there is a ton of affordable lodging in Sandpoint plenty of restaurants and good old taverns as well. There it is dear reader’s and if you’ve stayed with me through this long ride I hope I’ve turned your head a little toward a new adventure down a less ordinary path. I know I will be heading back.